All my guides are exceptional people, but some of them are also exceptional athletes. Since I run three or four times a week, I have a group of about ten masochists that take turn to suffer with me. Some of them will never compete with me, some of them will guide me through the toughest races and the most painful hours of my life. This week-end marked the beginning of the triathlon season, some of my friends were in Cali for the Oceanside 70.3 California, some were in Florida for the South Beach triathlon etc. Since it’s also March Madness, Matt, my usual guide on Saturday was in Houston for the week-end, all of this to say that even though I have many options, it was difficult to find someone to run 12 miles with me this week-end. 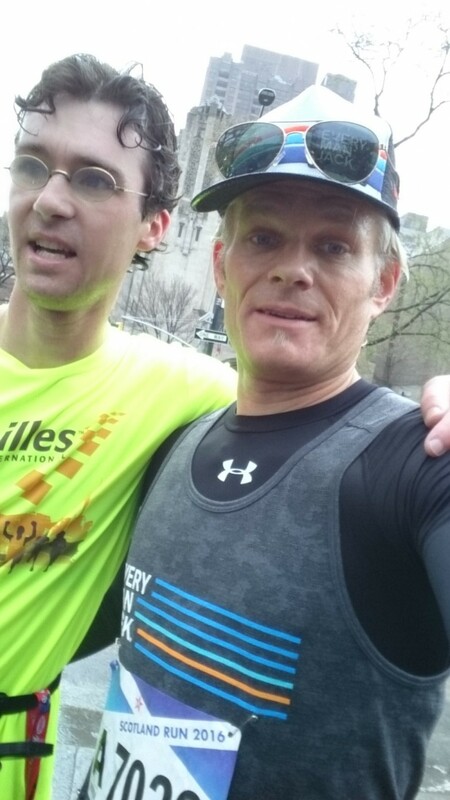 Thankfully, although he ran the Scotland race at 8 AM, Stefan agreed to run with me, he did 19 miles total just to help me out! That’s right, he raced 6 miles, jogged one mile to our rendezvous point, and guided me for 12 more miles, quite a morning. When I write about my races, I often forget how many sacrifices people did to get me there. I’m not only referring to my guides here, but also to my family, my coach, my friends etc. Sadly, I recently learned that Stefan won’t be able to run the Boston marathon with me, he has to work on April 18. I will miss his impeccable Germanic pacing! But most of all, I will miss my friend. Trust me Stefan, the memory of this long run under the rain will be the best source of motivation when I hit the wall on my way to Boylston Street.